This fence is on the river side of the Marcus Center. 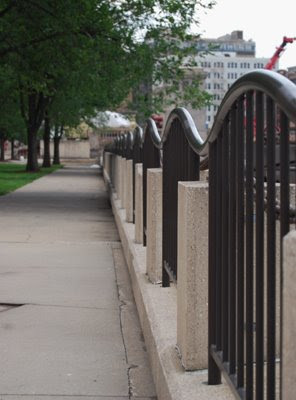 Its top rail is formed in a repeating wave pattern, and offers the eye in a diversion on the long stretch of sidewalk. The small park-like area in this space makes for a relaxing spot to hang out and watch the river traffic when the weather is nice.